At GraphExpo yesterday Colonial Press International of Miami, FL, USA sealed the deal for a new 2x8 Goss Sunday 3000 press that will triple the company’s existing press output and boost competitive capacity across a broader range of products. The 75-inch (1905mm) wide 2x8 format of the new five-unit Sunday 3000 press is unique in the market and was the key feature behind Colonial’s decision. Twice as wide as any of the company’s existing presses, the press has a cut-off of 22¼ inches (565 mm) and will be installed with both a pinless PFF3.2 folder and a JF80G jaw folder. This will enable Colonial to produce standard 8 ½ x 11, as well as double-parallel and tabloid products. The speed, format and configuration of the new Sunday3000 press means that it will triple Colonial’s existing press capacity and allow them to offer customers new production efficiencies, in terms of cycle times and print turnaround. 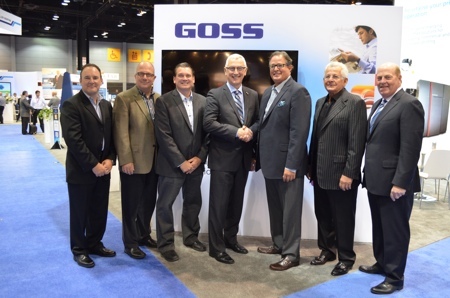 Goss and Colonial Press shaking hands on the deal yesterday at GraphExpo. (l to r): Phill Tilley (Goss), Mike D’Angelo (Goss), Daniel Michaels, COO, Colonial Press, Graham Trevett (Goss), Jorge Gomez, CEO, Colonial Press, Jose Gomez, Chairman, Colonial Press, Rick Nichols, CEO Goss International Corporation. Colonial Press is a company that in many respects characterizes the spirit of enterprise and opportunity associated with the American Dream. Founded in 1952, the current chairman Jose Gomez started work as a paper cutter at Colonial in 1970; 18 years later he owned the company, and today his son Jorge draws on his own extensive experience as a corporate accountant in heading the business. Located close to Miami airport, the company employs around 200 people and has a fleet of web and sheetfed presses, producing high-end print such as catalogs and magazines for corporate clients.